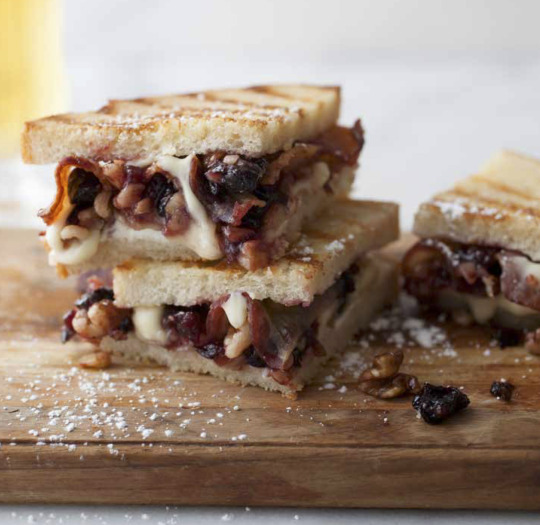 our taste buds with the decidedly adult flavors of cherries, walnuts, Brie, and bacon. Go on, get a little nutty. You know you want it. In a small bowl combine dried cherries, cherry jam and Grand Marnier. Just before using, fold in toasted walnuts. Butter one side of each bread slice. One two slices place two slices bacon each, half the brie and half the goat cheese dotted on top. Add a generous spoonful of the Cherry-Walnut Compote and season with salt and pepper. Place in the pan and top each with the remaining slices of bread. Grill for 2-4 minutes per side or until the bread is golden and cheese is melty. Serve with each sandwich sliced and dusted lightly with powdered sugar. Note: refrigerate any remaining compote in a covered container for 3-4 days.